Gov. Larry Hogan’s 11-member Redistricting Reform Commission, created on Aug. 6 by executive order, met for first time near the State House Thursday where they outlined their first steps to reform the process of drawing Maryland’s congressional and legislative district lines. 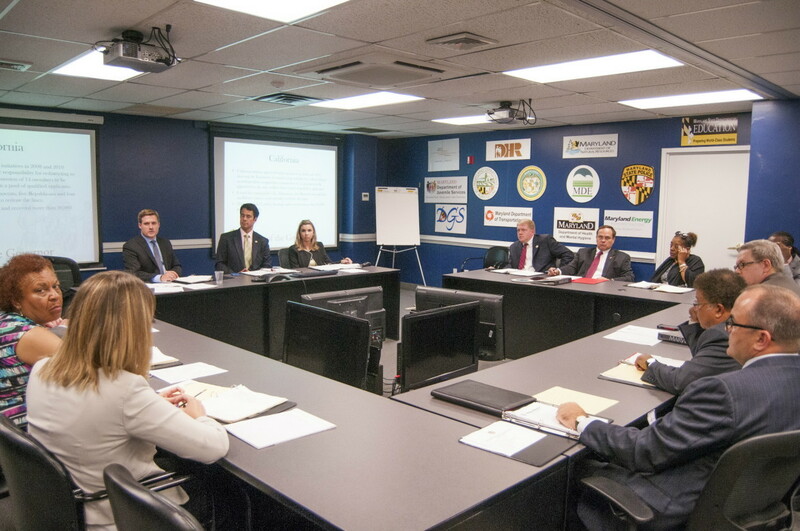 In order to combat Maryland’s A+ grade in gerrymandering, an unlucky subject to be excelling at, the commission plans to hold four to five “regional summits,” or public hearings, over the next two months. The final outcome will be a report outlining voters concerns with redistricting, due to the governor and General Assembly leaders by Nov. 3, less than 10 weeks from now. The commission will have to produce a quick turnaround with a “fairly aggressive” schedule, according to the governor’s office. In addition to the report, the commission is tasked with recommending a constitutional amendment on congressional and legislative redistricting to be introduced during the Maryland General Assembly’s next legislative session. “If we are going to set up an independent, nonpartisan commission to draw lines for congressional (redistricting) … to take the power away from politicians to choose their constituents and make it the other way around, to make it so constituents can choose their representatives, I would argue it makes sense to do it for both congressional redistricting and legislative,”explained Patrick Hogan, a deputy legislative officer for the governor, as well as his brother and a former delegate. The commission is made up of two state senators, two state delegates, two public policy experts, one representative of a non-profit voters advocacy organization and one government reform advocacy representative. All agreed upon finding accessible locations to hold these meetings, in order to hear as many voters as possible. “If there are 300 people on the sheet and signed up, we hear them, okay? We hear them,” said Sen. Joan Carter Conway, D-Baltimore City. Conway chairs the Senate Education, Health and Environmental Affairs Committee, which also handles election law. The commission plans to invite guest speakers, experts in their private fields, who will be presenting their own research at these hearings. “Maybe we want to reserve the first half-hour for expert testimony…for people (to speak) who represent a large group of folks, whether it’s ideological or whether they represent a certain community,” said Sen. Steve Waugh, R-St. Mary’s and Calvert. The final structure of the meetings was not set, however members agreed on creating a pre-registering process for citizens to receive a timeslot in which to give their testimony. Co-chair Walter Olson addresses the commission. From left, Del. Alonzo Washington, Olson, Co-chair Alexander Williams, Christopher Summers. Co-chair Alexander Williams, Jr., a retired United States District Judge and a former elected State’s Attorney for Prince George’s County. Co-Chair Walter Olson, Frederick County resident and representing the Cato Institute, a Washington D.C. libertarian think-tank . Sen. Joan Carter Conway, D-Baltimore City, appointed by the Senate President Mike Miller. Sen. Steve Waugh, R-St. Mary’s and Calvert, appointed by Senate Minority Leader J.B. Jennings. Del. Alonzo Washington, D-Prince George’s, appointed by Speaker of the House Michael Busch. Del. Jason Buckel, R-Allegany, appointed by House Minority Leader Nic Kipke. Dr. Michael J. Goff, board member of Common Cause Maryland and CEO of the Northeast-Midwest Institute, a nonpartisan research, policy and education organization. Tessa Hill-Aston, President of the Baltimore City Branch of the NAACP. Christopher B. Summers, President of the Maryland Public Policy Institute. Ashley Oleson, administrator for the League of Women Voters of MD. Carol Ramirez, 25-year resident of Bethesda, with a background as a small business owner, banker and volunteer. The schedule for regional meetings is to be posted at this link when available.